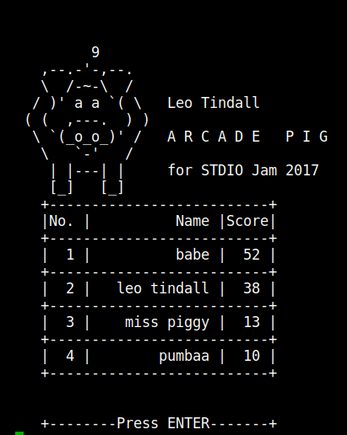 This is an "arcade style" game of Pig, created as an example to teach Rust. It allows multiple players to complete games of Pig, keeping the scoreboard in memory and displaying it on-screen to entice new players. The source code is annotated so that beginners to Rust or programming in general should be able to understand it. This source code is released under the terms of the MIT License. It was created by Leo Tindall. It should run on any Rust-supported platform (Linux, Mac OS, Windows, most BSDs, and others). I was unable to compile it for Mac OS because I don't own a Mac.